Carissa identifies with having recovered from BPD. 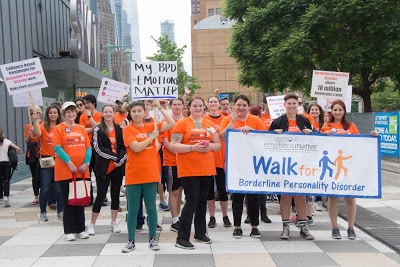 She recently returned from New York after interning for 10 days with Emotions Matter – a NFP organisation dedicated to empowerment, raising awareness and advocating for changes to the U.S. health care system for people with BPD. Emotions Matter was formed by three women who each share a bond of experiencing a loved one with BPD and coming together to fight stigma and improve treatment. During Carissa’s visit, Emotions Matter showcased how they joined with other mental health organisations such as Brooklyn Minds, to develop a comprehensive approach to raising awareness and improving service responses to people with BPD. As the U.S. has a different system of government to Australia, organisations such as Emotions Matter are funded differently and rely on marketing themselves more actively to attract donors; recognising the strategic importance of forming strong partnerships. Carissa met with mental health professionals, people with lived experience, and families and experienced the trip as insightful and enlightening. She met with organisations including Fountain House which uses a Recovery and social inclusion approach to address mental health, attended a ‘Recognising Women in Mental Health’ lunch organised by the Brain and Behaviour Research Foundation which provides grants to reward and develop scientific advances in mental health, and met with psychiatrist Dr Daphne Simeon, who was particularly interested in Carissa’s lived experience and is currently developing her own therapy model. People were grateful for Carissa’s perspective and lived experience and keen to hear about her story. They were particularly keen to hear about Australia’s Peer Support Model as this currently does not exist in the U.S. Carissa shared her experiences of the mental health system in Australia and learnt that people with BPD haven’t always been treated well, some are refused hospitalisation at times due to not having insurance, and one case where a person was mechanically restrained to a bed due to self-harm. Different treatment modalities were discussed, with some organisations having preference for one modality over another, posing the question from a lived experience, as to whether preferring one treatment modality over another is effective enough. Overall, Carissa believes Australia is more progressive in the area of mental health and treatment of people with BPD than the U.S., but that people working within the system in the U.S. are keen to learn from us and catch up. The visit culminated in the inaugural ‘Walk for BPD’ which approx. 150 people attended and which raised $10000.The National Alliance on Mental Illness (NAMI) walk also occurred during Carissa’s visit and 5000 people from different mental health organisations came together to raise awareness and money. Carissa feels the overall community feel about mental health and awareness and the presence of mental health organisations is better in the U.S. than it is in Australia. Now back in Western Australia, Carissa has a renewed determination and drive about advocating for people with BPD and changing the mental health care system. She feels reassured she is doing good work, excited about future opportunities, and realises that things are progressing and change is happening, ‘even though it may not seem it at the time’.